The wormhole error in brief. - A Brief History of Time-lessness - Matt Welcome. 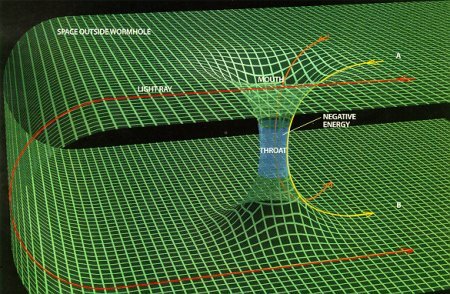 Concerning Wormholes, ultimately I am saying, if i am correct, the chain of errors that leads us to wrongly consider the possibility that we might travel through time and space in unusual ways if we could 'travel' through a black hole are as follows. Einstein's theories on relativity essentially work with great accuracy - this leads us to be open to accepting all assumptions made early within them. In Einstein's accounts of his work (e.g. the books 'relativity' and 'the meaning of relativity' ) he goes straight into using the concept of time without first proving its existence or function as something extra to or different from "movement and interaction of matter 'now'". Specifically Einstein doesn't prove that as things 'happen' and change their surroundings 'now' - be these changes in our 'memories' or the matter around us - another 'third' record of events is created by 'time' and accumulated in 'the past'. More specifically Einstein doesn't highlight that while our memories etc seem to prove that things move and change 'over time' they only prove things move and change - and then he doesn't go on to give a true reason to assume this extra thing 'time' exists. While Einstein seems to have gone straight on with assuming 'time' has some reality other than a useful notional framework to describe matter moving and existing now - many people seem to assume that Einsteins work itself gives credibility to - ie effectively proves' - That Time exists as something extra to just matter and motion existing and happening 'now'. (one needs to understand relativity reasonably well to see this, relativity is tricky to understand, thus those who havent understood its essence may default to assuming its complexity relates to it also being a proof of the existence of time). But the opposition to the credibility of space-time has already been overlooked as the assumption of time was made. In fact this concept may be acceptably understood in terms only of 'dilatable' motion happening just 'now', in warpable space. We know we can travel through the 3 obvious dimensions - so the default assumption is 'things may be able to travel through a fourth dimension if one exists. But this mathematics can also be seen just in terms of warping and dilating happening somewhere now - or not happening somewhere now. But this view is less exciting as it kills concepts like time travel etc. Diagrams illustrating warped space often show a dipped or deformed mesh around a massive object. The smaller image orbiting the larger one here gets across the concept very well that "Mass tells space how to bend, and how bent space tells mass how to move" - the same effect can be directly recreated on a stretched rubber sheet. While this is a very useful way of expressing on a flat image how 3D space may be warped, it may also be the beginning of a misunderstanding if taken too literally. Really we are just trying to convey that the effect of gravity is more intense near the mass that is causing space to warp. But the elegance of the first diagram prevails and this 'dip' is often exaggerated to resemble a 'well'. Further exaggeration - and the removal of the object causing the dip, can give the impression that the 'well' is a 'tunnel'. Next, the mathematics concerning black holes suggest a 'singularity' at their centre. The concept of a mysterious singularity opens our mind to the possibility that other mysterious and unexplainable thing may be possible in the area we are discussing. In fact (unless the existence and function of 'time' has been proven elsewhere) it is only reasonable to assume that something exotic is happing physically in the centre of the super massive object. If time does not exist - then no matter how exotic a frozen star - or 'black hole' may be - no matter how much it warps space , and changes the rate at which things happen in that space - Surely , logically it is just an object we could 'put in a box' so to speak. With the assumption that 'time' exists and that 'time' and space are the same thing, the (non existent) 'tunnel' - imagined to exist in a (misleadingly named) 'black hole'is imagined to possibly go to some other place and/or time. Hence the concept of a wormhole is formed - based on at least 5 seriously questionable assumptions. Perhaps a better starting thought experiment may be to just consider how a (actually impossible) physical tunnel through a black hole may work. >>∆ Professor Hawking's Mad Scientist Paradox - without Time. See also >>Black hole communications.